A former tennis champ-turned-budding business leader has received the University of Virginia’s Sky Alland Scholarship. 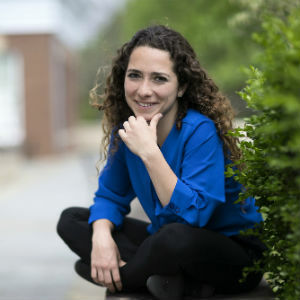 Michelle Fabiola “Faby” Chaillo, a third-year commerce major from Mexico City and Falls Church, will receive full tuition and fees for her fourth year at the University as well as a $10,000 stipend for living expenses. The scholarship is awarded to the third-year student who best exemplifies leadership, achievement, enterprising spirit, humility and devotion to the University. The award is named for J. Schuyler Alland, a 1979 graduate of the McIntire School of Commerce and entrepreneur who built a successful national marketing research company before he was killed during a carjacking in 1992. “My first reaction when I read the letter on the Lawn was to re-read it to make sure I wasn’t dreaming,” Chaillo said. “And then I cried with happiness. Chaillo won Virginia High School League Group AAA singles championships in 2009 and 2012, and was No. 1 in her age group in the U.S. Tennis Association’s Mid-Atlantic rankings and No. 18 nationally. However, injuries essentially ended her competitive tennis career before she arrived at UVA. Multiple surgeries eventually led her to miss the 2014-15 academic year. She used part of her time away from UVA to work with Coulter Companies (now MCI USA), a McLean-based association management firm. Fluent in French and Spanish, Chaillo was given responsibility to plan a Chanel Fashion Leadership Meeting in New York City. As a business major, Chaillo is focused on marketing and is investigating the effects of different colors in promotions across cultures. Chaillo, a 2012 graduate of George C. Marshall High School, has been on the dean’s list every semester and received a Lorna Sundberg International Scholarship, given to a rising fourth-year international student who has demonstrated academic merit and commitment to community service. She is president of the Commerce School Council; a member of the Class Council; a trustee on the graduation committee;; and a member of Sustained Dialogue and Pi Beta Phi sorority. She has maintained her love of athletics as special events chair on the executive committee of the ’Hoo Crew, the official student athletic fan group at the University; a volunteer for the Special Olympics; second-year social chair for the Tennis Club; as a member of the performance team and a choreographer for the Salsa Club. She was a Marketing Campus Ambassador for Cross Cultural Solutions, a nonprofit devoted to volunteering abroad. She participated in the H’University Entrepreneurship Program, a weekly webinar by successful chief executive officers and other entrepreneurs, and brought Movember, a men’s health group that promotes growing mustaches to raise awareness about cancer, to UVA as part of the final project. She is also working on the development of a music-based social media application. Over the years, the Alland Scholarship has gone to wide array of students. Chaillo said she is very grateful to receive the scholarship because it means the people who recommended her see in her the five qualities the scholar is supposed to exhibit. She said it also eases the financial burden of attending college.